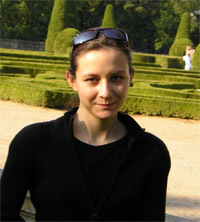 Agata Fratczak is a third year graduate student. She has been applied isoenergetic microarrays to study the structure of RNA as well as the RNA-protein and RNA-RNA interactions. She began her research on two regulatory RNAs: DsrA (87 nucleotides) and OxyS (109 nucleotides) from E. coli. These RNAs bind to target mRNAs and influence protein translation and Hfq protein facilitates this process. OxyS is involved in transcription regulation over 40 genes such as fhlA and rpoS. DsrA regulates rpoS and hns mRNA transcription. On initial step of the work Agata Fratczak determined the secondary structure of those regulatory RNAs using the microarray mapping method. Once the structures were solved she moved on to investigate the interaction of regulatory RNAs with Hfq protein. Using microarray mapping method she was able to identify a single stranded region of the RNA which is involved in the RNA-protein complex formation. She has just started studying complexes which involve regulatory RNA and target mRNA leader fragments found to be involved in complementary interactions with DsrA RNA and OxyS RNA. In the near future, she will study three molecular complexes included both interacting RNAs and additionally Hfq protein. Recently, Agata Fratczak also solved the secondary structures for two new RNAs as a part of a collaboration with Prof. Beatrix Susses from University of Frankfurt. Professor Susses is working on riboswitches and has recently identified two putative riboswitch RNAs (Sc1 and Sc32, that are 190 and 147 nt long, respectively) whose biological function has yet to be determined. They were isolated from Streptomyces coelicolor, soil-dwelling bacteria which are notable for their production of large variety of antibiotics and other pharmaceutically useful compound including anti-tumour agents and immunosupressants.